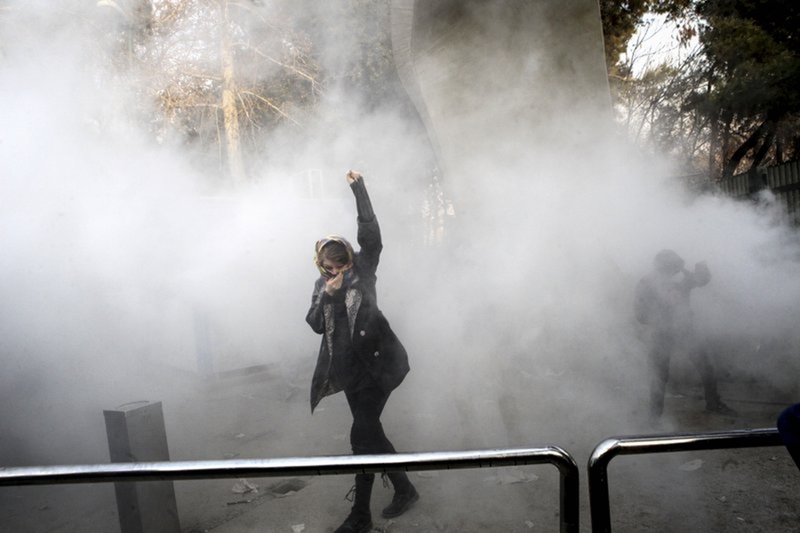 Nationwide protests in Iran saw their most violent night as “armed protesters” tried to overrun military bases and police stations before security forces repelled them, bringing the death toll in the unrest to at least 12, state television reported Monday. The demonstrations, the largest to strike Iran since its disputed 2009 presidential election, began Thursday in Mashhad over economic issues and have since expanded to several cities, with some protesters chanting against the government and the supreme leader, Ayatollah Ali Khamenei. Hundreds of people have been arrested. Iranian state television aired footage of a ransacked private bank, broken windows, overturned cars and a firetruck that appeared to have been set ablaze. It reported that clashes Sunday night killed 10 people. “Some armed protesters tried to take over some police stations and military bases but faced serious resistance from security forces,” state TV reported. It did not say where those attacks occurred. Later Monday, state TV said clashes killed six people in the western town of Tuyserkan, 295 kilometers (185 miles) southwest of Tehran. It said clashes in the town of Shahinshahr, 315 kilometers (195 miles) south of Tehran, killed three more. It did not say where the 10th person was killed. Earlier on Monday, the semi-official ILNA news agency quoted Hedayatollah Khademi, a representative for the town of Izeh, as saying two people died there Sunday night. He said the cause of death wasn’t immediately known, though authorities later described one of the deaths as the result of a personal dispute. Many in Izeh, some 455 kilometers (280 miles) southwest of Tehran, have hunting rifles in their homes. Two protesters also were killed during clashes late Saturday in Doroud, some 325 kilometers (200 miles) southwest of Tehran in Lorestan province, authorities earlier said. On Sunday, Iran blocked access to Instagram and the popular messaging app Telegram used by activists to organize. President Hassan Rouhani acknowledged the public’s anger over the Islamic Republic’s flagging economy, though he and others warned that the government wouldn’t hesitate to crack down on those it considers lawbreakers. That was echoed Monday by Iranian judiciary chief Ayatollah Sadegh Larijani, who urged authorities to confront rioters, state TV reported. “I demand all prosecutors across the country to get involved and approach should be strong,” he said. While some have shared Trump’s tweets, many in Iran distrust him as he’s refused to re-certify the nuclear deal and as his travel bans have blocked Iranians from getting U.S. visas. State TV also has reported that some protesters invoked the name of the U.S.-backed shah, who fled into exile just before Iran’s 1979 Islamic Revolution and later died. Iran’s economy has improved since its 2015 nuclear deal with world powers, which saw Iran limit its enrichment of uranium in exchange for the end of some international sanctions. Tehran now sells its oil on the global market and has signed deals to purchase tens of billions of dollars’ worth of Western aircraft. It wasn’t immediately clear if the Guard would change its posture given the reported attacks on police stations and military bases. In Tehran on Monday, streets were calm, though a heavy police presence was noticeable to passers-by. Protests in Iran, Social Media Apps Blocked. People reported killed in the protests. The demonstrations, which began Thursday over the economic woes plaguing Irany, appear to be the largest to strike the Islamic Republic since the protests that followed the country’s disputed 2009 presidential election.